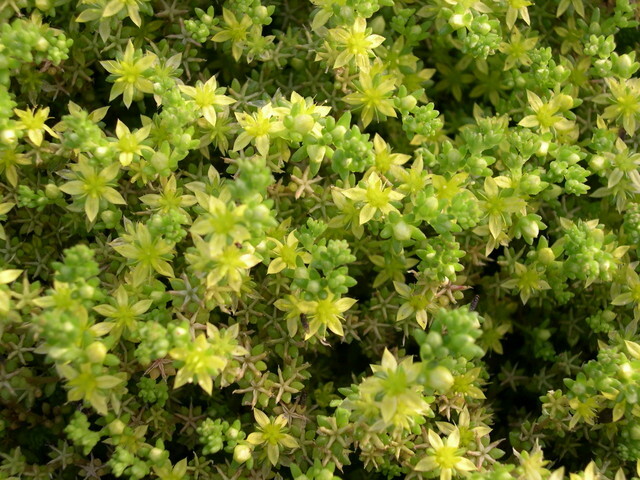 Originally, I purchased this variety from a nursery where it was misnamed Sedum 'Takasui'. Many years later I sent a digital photograph of it to Ray Stephenson, editor of the Sedum Society newsletter and author of 'Sedum Cultivated Stonecrops'. Ray asked me to check for hyaline papillae (glassy rods) at the tips of the leaves. It did and his suspicions that it was Sedum grisebachii kostovii were confirmed. Bright green leaves turn reddish in summer. Plant becomes covered with golden yellow flowers. Doesn't like winter wet feet. From Greece and Bulgaria.